If you’re planning to grow cannabis at home as the ACMPR now allows, you might want to think about complementary plants. Here are 7 flowers that you can plant safely alongside your home grow cannabis garden that will also help your plants flourish. Most of us know of chamomile being used as a tea, but it’s also a great companion plant for your cannabis garden as well. It increases oil production in neighbouring plants, and has antifungal properties. It also accumulates calcium, potassium, and sulfur. Calcium and potassium can help strengthen your cannabis stems, and sulfur will repel insects. Chop it up and use it as mulch to help pass these minerals to the rest of your garden. Don’t forget to dry some out for a nice calming cup of tea. Or believe it or not, throw some fresh chamomile leaves in a salad for a light apple taste. It’s known for it’s antibacterial properties, anti-inflammatory agents, and of course, to help with sleep. Chrysanthemums—also known as chrysanthes, or more commonly, mums—are a great addition to your outdoor cannabis grow. There are over 100 varieties of these pretty little flowers, and many of them contain a natural insecticide called pyrethrin. Pyrethrin kills a variety of damaging insects, including problem pests like spider mites and aphids. Prevent your plants from getting an insect infestation with chrysanthemums! These flowers can double as an easy health remedy: steep in hot water for a high dosage of uncaffeinated but rejuvenating tea. Chrysanthemum tea is a good way to detox, and is known to help reduce fever and cold symptoms. A calming tea, it’s also a good dose of B Vitamins choline, folacin, niacin and riboflavin, as well as Vitamin C.
The large and lovely mullein has multiple nicknames, including Jupiter’s Staff and Bunny Ears, describing its tall stalks and fluffy flowers. Although a pretty addition to your garden, you might want to be a little careful with letting the seeds spread or risk it becoming an invasive weed. This plant attracts all sorts of bugs, bringing beneficial bees to your garden as well as the insect dicyphus, which will eat whiteflies, aphids, and spider mites. Mullein too has some healing herbal properties. Tea made out of the leaves or flowers is known to be an excellent expectorant that loosens and flushes out phlegm. It’s used to relieve coughs resulting from bronchitis and consumption. It can also be smoked to help relieve chest congestion and asthma, although smoking anything comes with additional risks. These tiny little white flower buds are more powerful than you know. These pretty little weeds attract predatory wasps, which can help rid your garden of pests, and also ladybugs, which eat spider mites. Yarrow has deep roots that take in potassium, phosphorus and copper, which makes it an excellent plant to chop into a nutrient-rich mulch for your garden. Yarrow is another edible plant—it contains flavonoids that increase saliva and stomach acid to help improve digestion. It’s also known to help relieve stomach and menstrual cramps. We’re not talking about lucky four-leaf clovers, but red, white, and crimson plants that help add richness to your soil. These pretty flowers grow low to the ground and have deep roots. The roots pull nutrients and minerals out, and form a living mulch that covers exposed soil in your garden and keeps water in. They also help prevent the erosion of topsoil. Like many of these other companion plants, red clover can also be made into a tea. It has multiple valuable nutrients, including calcium, magnesium, potassium, and vitamin C among others. Known to be good for indigestion, coughs, and bronchitis, it’s also known to be a rich source of isoflavones. Isoflavones are water-soluble chemicals that act like estrogens, which may be why clover is used by some women for symptoms of menopause. It can help limit hot flashes, breast tenderness, and premenstrual syndrome symptoms. Marigolds, or calendula, are sweet-smelling, colourful flowers with multiple uses. 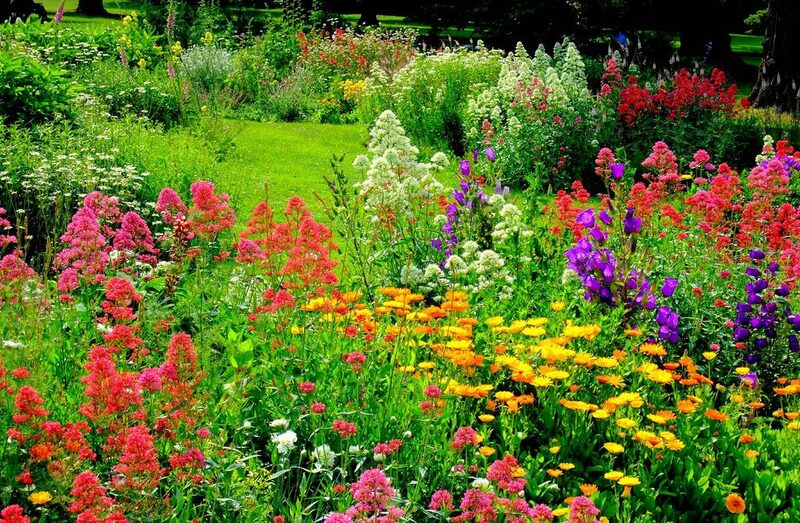 These flowers repel insects and other pests, as well as kill plant-parasitic nematodes that can hurt your other plants. Some gardeners claim that marigolds also help keep bigger garden pests like raccoons, bunnies, and deer away from your edible plants. Some edible varieties are Marigold officinalis, also known as Pot Marigold, Sun’s Gold, and Marybud, as well as Mexican Marigold Mint, also known as Root Beer plant or Cloud Plant. They’re often used in salads to give a slightly bitter, citrus zip. As a tea, they can help with digestion and reduce inflammation, including menstrual cramps. Or consider topical use—marigold salves are known to be soothing and can be used to help treat skin conditions and to relax tense muscles. Plant them between and around the parameters of your beans to help assure other animals don’t eat your sprouts! Although bean plants are known as vegetables first, they also have some really pretty flower varieties. Beans are high in nitrogen, and nitrogen is one of the most common cannabis plant deficiencies. When a cannabis plant is low in nitrogen, it starts to turn yellow. Beans pull nitrogen out of the air and transform it into nitrates. The nitrates assure the cannabis crops are healthy, while the flowers and vines provide some lovely coverage, if you’re shy of neighbourly stares. Of course, they’re also a great snack, fresh off the vine!